Kate: All across London the Queen's Diamond Jubilee Celebrations have begun! Chelsie and I have been on a quest to find you the very best afternoon tea's honouring this glorious occasion. We could not resist sharing with you all this simply stunning Jubilee Afternoon Tea served exclusively at the Palm Court in The Langham Hotel. 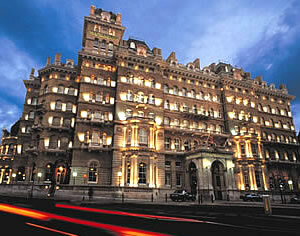 The Langham Hotel is a beautiful five star luxury hotel in Regent Street. The hotel has recently been presented by the prestigious Tea Guild an 'Award of Excellence' in recognition of their outstanding quality and consistently high standards in tea service. With this in mind, Chelsie and I can only imagine how amazing this tea must be! 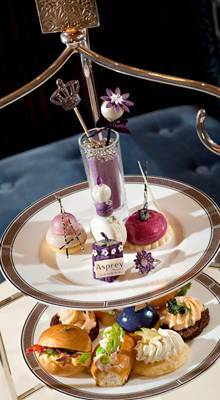 Chelsie: This Afternoon Tea designed especially for the Diamond Jubilee sees The Langham Hotel join forces with the luxury goods brand Asprey. The Langham's critically acclaimed Head Pastry Chef, Cherish Finden, has designed a selection of dreamy delights based on her interpretation of Asprey's highly desirable jewellery collections. Kate and I cannot wait to try this afternoon tea! The Asprey Afternoon Tea is priced at £49, and is available until October 2012.